"Pulitzer Prize-winning author Stacy Schiff follows up her 2010 biography Cleopatra: A Life with this fascinating portrait of one of the foundational moments in American History. 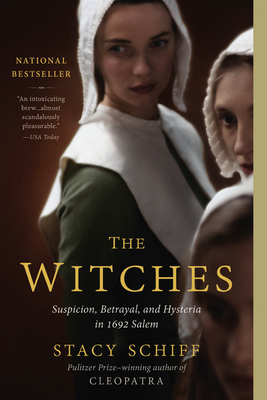 Placing the Salem Witch Trials in its proper historical context, Schiff explores the personalities. events, and societal pressures that created a perfect storm for a paranoid outbreak to spread across the population. This is a fascinating read that’s perfect for the Halloween season." "Speaks the Nightbird by Robert McCammon is a fantastisized and adventurefied account of witch hunting colonial Virginia. Witches by Stacy Schiff is the real deal. If you love the historical fiction, check out the historical history." Pulitzer Prize winner Stacy Schiff, author of the #1 bestseller Cleopatra, provides an electrifying, fresh view of the Salem witch trials. The panic began early in 1692, over an exceptionally raw Massachusetts winter, when a minister's niece began to writhe and roar. It spread quickly, confounding the most educated men and prominent politicians in the colony. Neighbors accused neighbors, husbands accused wives, parents and children one another. It ended less than a year later, but not before nineteen men and women had been hanged and an elderly man crushed to death. Speaking loudly and emphatically, adolescent girls stood at the center of the crisis. Along with suffrage and Prohibition, the Salem witch trials represent one of the few moments when women played the central role in American history. Drawing masterfully on the archives, Stacy Schiff introduces us to the strains on a Puritan adolescent's life and to the authorities whose delicate agendas were at risk. She illuminates the demands of a rigorous faith, the vulnerability of settlements adrift from the mother country, perched-at a politically tumultuous time-on the edge of what a visitor termed a "remote, rocky, barren, bushy, wild-woody wilderness." With devastating clarity, the textures and tensions of colonial life emerge; hidden patterns subtly, startlingly detach themselves from the darkness. Schiff brings early American anxieties to the fore to align them brilliantly with our own. In an era of religious provocations, crowdsourcing, and invisible enemies, this enthralling story makes more sense than ever. The Witches is Schiff 's riveting account of a seminal episode, a primal American mystery unveiled-in crackling detail and lyrical prose-by one of our most acclaimed historians.